You are currently browsing the archives for the Local Guides category. For seventy years, North Carolina law capped ABV for beer sold in the state at 6%. In 2005, thanks to the efforts of the Pop the Cap initiative, that limit was raised to 15%. Today, North Carolina is home to the most microbreweries in the South, and at local restaurants and bars, you can usually find more craft beers on tap than watered-down domestics. Here are our favorite spots in Carrboro and Chapel Hill to grab a bite and a brew. If you’ve ever been to Carrboro, you’ve likely been to Weaver Street Market. The local co-op grocery is the heart of Carrboro, geographically and figuratively. What you may not have realized is that Panzanella, the Italian restaurant around the corner, is also owned by the same community. 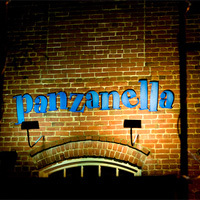 Panzanella is committed to keeping it local, with a seasonal farm-to-table menu and a summer beer dinner series featuring all local breweries. If you can make it, you must go to a beer dinner, where they pair up their farm-fresh cuisine with a variety of brews from each brewery. And the vegetarian options at these dinners are just as good as the non-veggie. The part of North Carolina we work in is a bit of a foodie utopia. Here in Carrboro, our downtown streets are lined with restaurants serving up everything from French cuisine, to New York-style pastrami, to traditional comfort food. Chapel Hill, a two-minute walk from our office, has many culinary delights of its own, including two 2011 James Beard winners. In the first of our Blogads Local series, we’ve pick our favorite two restaurants in Carrboro and Chapel Hill. It’s only a small coincidence that our favorite restaurants were also honored by the James Beard Foundation earlier this year. 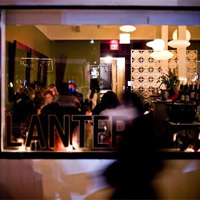 As Food & Wine magazine put it, “everyone who comes to Chapel Hill loves Lantern.” Listed by Gourmet as one of the top 50 restaurants in America, this farm-to-table pan-asian restaurant is a Blogads favorite for dinner. Chef Andrea Reusing was recently crowned the Best Chef in the South by the James Beard Foundation. So yeah, it’s really good. Dinner: White meat or the other white meat. Check out the Tea-smoked chicken or the pork shank. You can’t go wrong either way. Dessert: When it’s in season, you must try the basil mint sorbet, served with a home made fortune cookie. Chef Bill Smith is no stranger to the James Beard Foundation either. In 2009 and 2010, he was a finalist for the Best Chef of the Southeast Award. 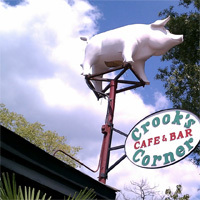 This year, the Beard Foundation gave the well-loved Crook’s Corner the America’s Classic award for its “timeless appeal” and “quality food that reflects the character of their community.” The seasonal menu boldly explores Southern cuisine, with incredible specialties for every course of your meal. Hey, there’s a big pink pig on their sign for a reason. Try the Carolina sampler: pit cooked pulled pork served with hoppin’ John, collard greens and black pepper cornbread. If it’s still on the menu, check out the honeysuckle sorbet, made from locally harvested honeysuckle plants. Obviously, supplies are limited. In coming weeks we’ll tell you our favorite spots for vegetarians, great places to have a beer with your meal, and where to eat when you’re in a hurry.